Olivia Roberts: NLP Master Practitioner & alternative pain specialist. Creator of a new alternative therapy, ‘Resolution Magic’ a unique programme to make unwanted feelings and physical symptoms disappear. Olivia Roberts spends her life as a therapist, guiding her clients through a series of mental exercises that gradually reduce their unwanted feelings and physical symptoms until they disappear. Olivia discovered these unusual techniques over 25 years ago, when she used them to end her symptoms of migraine, chronic fatigue and full-body pain. 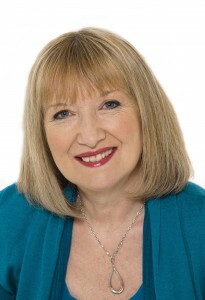 She created the unique Resolution Magic programmes in 2003, when she began her work as a full-time Resolution Magic practitioner. Since then, over 450 people have used her methods to make their debilitating symptoms disappear. Olivia has helped clients with M.E, migraine, Irritable Bowel Syndrome (IBS), Seasonally Affective Disorder (SAD), depression, euphoria, neuralgic pain, sinusitis, indigestion, cystitis, vertigo, sensory-sensitivity, backache, sciatica, neck and shoulder pain, arthritic pain, and many other unusual symptoms. Olivia is an experienced speaker having presented at many events and training courses. Visit the home page to view Olivia in an interview on a Las Vegas TV Show. (More links to TV Show below). Findhorn Press Author, International Speaker & Therapist, Senior Hypnotherapist, NLP Master Practitioner and Master Resolution Magic Practitioner. Creator of the ‘Resolution Magic Programmes’© for symptoms and conditions including: migraine, Irritable Bowel Syndrome, chronic fatigue, depression, vertigo, backache, chronic indigestion and chronic pain etc. Originator of the ‘Theory of Neurological Wave Syndrome’©– a hypothesis of the cause of ‘psychosomatic’, ‘auto-immune’, and almost all ailments. After studying Advanced NLP and with her knowledge of conventional medicine, Olivia created the Resolution Magic Programmes for physical and psychological symptoms in 2004. 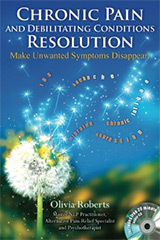 Resolution Magic is a collection of techniques and mental exercise that gradually reduce unwanted feelings and physical symptoms until they often completely disappear. Clients are coached by telephone, week by week, as they learn the various mental exercises that retrain the neurology, change the effects of everyday life, and change the effects of past experiences. Follow-up continues indefinitely after symptoms have disappeared to monitor the efficacy of this programme. Over 300 people have used the programme for a wide variety of ailments. Olivia runs workshops and delivers presentations to groups of people who suffer from chronic pain, fibromyalgia, migraine, or tinnitus etc. and presents at various locations, to groups of people with medical conditions, at Positive Living Groups and also at Mind, Body & Soul exhibitions. 26 years ago, Olivia suffered from daily migraine, full-body pain and chronic fatigue. Without any knowledge of medicine or alternative therapy at that time, she created an unusual mental exercise routine that, by sheer good luck, gradually reduced my symptoms until they completely disappeared. Olivia returned to normal life, studied science and became a medical representative for 12 years, where she became knowledgeable about conventional medicine and clinical research. She was also a trainer in sales and presentation skills, and organised medical conferences. In 2002-3, Olivia studied hypnotherapy and Advanced Neuro-Linguistic Programming at The Dominic Beirne School of Clinical Hypnosis and Psychotherapy in Stratford-upon-Avon. Following this, Olivia created the Resolution Magic programme based not on NLP, but on her own techniques – and volunteers began to try it. Olivia was amazed when it worked for other people, and soon many people used the programme for an expanding number of symptoms and conditions, including Irritable Bowel Syndrome, depression, backache, cystitis, earache, sinusitis, and many more. These case studies became the foundation for the book that was published this year. The book also contains all of the steps of the programme, and Olivia’s original ‘Theory of Neurological Wave Syndrome’© – Olivia’s explanation of the root cause of almost all physical and psychological symptoms. Olivia has recently returned from a USA book tour, where she recorded two TV Shows, a radio show, and book-signings at book stores. Presented at The Vitality Show, Olympia, London, on March 24th 2013. Presenting at The Energy Conference in Gatwick, Nr London, UK, November 2013. Recent publication: Spirit & Destiny, January 2013 Issue: An article about a client who used Resolution Magic to reduce many years of daily, severe, full-body pain and twice-weekly epileptic seizures until these symptoms completely disappeared. Future publication: Association of NLP (ANLP) magazine , spring edition, ‘Featured Author’ article. Olivia describes her own story, how it led to the creation of Resolution Magic, and the discovery of the cause of many physical, and psychological symptoms. Olivia’s own story; how debilitating illness led to the creation of Resolution Magic, a programme of mental exercises that gradually reduces unwanted feelings and physical symptoms until, quite often, they completely disappear. Olivia illustrates many points by describing case histories taken from over 300 accounts where people have used the programme for a wide variety of symptoms and conditions. Introducing the shocking new theory of ‘Neurological Wave Syndrome’ – the root cause of many physical and psychological symptoms and conditions. Olivia gathered clues from medical research and her own work with fellow sufferers to develop this theory. The mental exercises of the programme explained – step by step. Case studies and advice for individual conditions and symptoms. Olivia’s own story, step-by-step instructions of the techniques, and over 50 case histories are contained in her book.